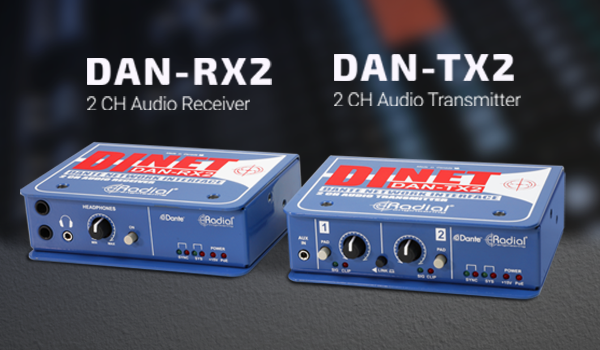 Vancouver, BC – Radial Engineering is pleased to announce that the DiNET DAN-TX2 and DAN-RX2, 2-channel Dante-enabled network interfaces, are now shipping. 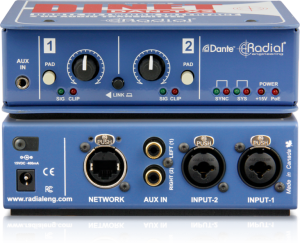 The DAN-TX2 is able to feed any line-level audio signal to a Dante network, using a number of connector types to suit multiple applications and source devices. Two input channels can be accessed via XLR/TRS combo jacks for balanced pro audio equipment, RCA’s for consumer playback devices, and a 3.5mm stereo jack for use with smartphones and tablets. Individual level controls and input pads are provided for each channel, or they can be linked to a single set of controls for easy operation with stereo sources. 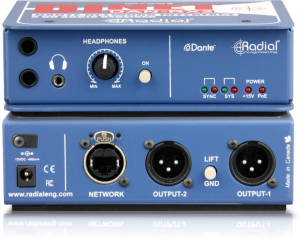 The DAN-RX2 is a receiver that can be connected anywhere on the network and provide balanced analog audio outputs over XLR connectors, for reliable distribution to PA systems, powered speakers, or any other destination as needed. A separate headphone output section is also provided, with 3.5mm and 1/4″ TRS outputs to use the DAN-RX2 as a personal monitoring system or for testing purposes.